I’m taking a few days off from my serialized posting of the original art pages to my uncollected 1994 graphic novel, “The Mark In America” to post and blog about one of the highlights of my collection, the complete set of all 9 pages of original artwork, by Lee Elias, to “Banker’s Holiday”, starring the Black Cat. 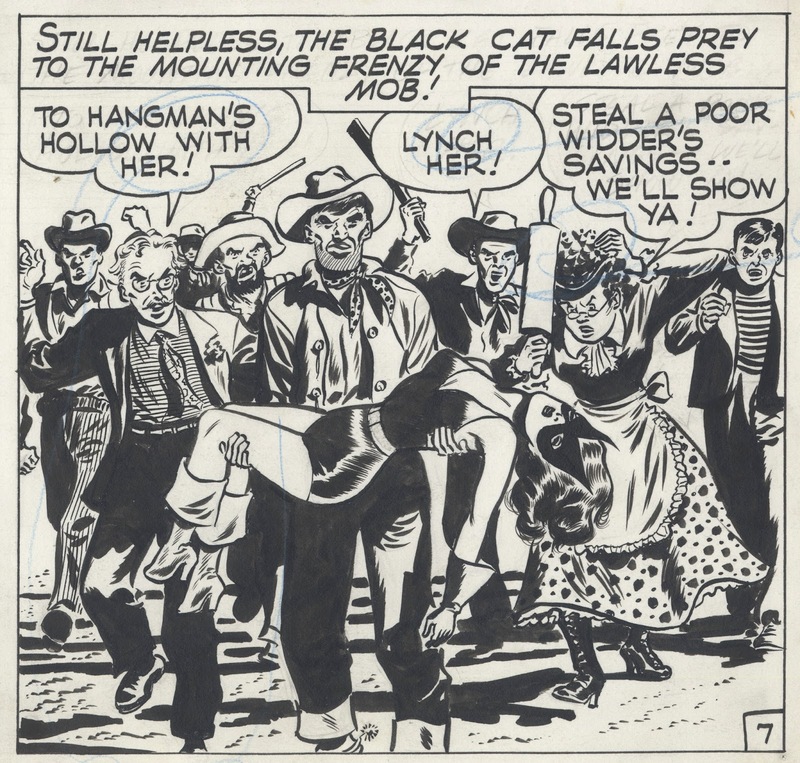 The story was first printed in “Black Cat” #2, published by Harvey Comics in August/September 1946, reprinted in “Black Cat” #10 (1948), and still later in “The Original Black Cat” #5, published by Lorne-Harvey in 1991. This is page #7. Elias was burning hot on this page; again the page as a whole is stunning and the individual panels work beautifully when considered by themselves. Panel 1 is yet another crowd scene in a story replete with crowd scenes. One could do worse the study this story just for that alone. Each one serves to advance the story, attacks the problem (how does one compose crowd scenes without it being PAINFUL, both as the artist and as the reader) differently, finding a different solution. In some previous panels, Elias spotted his black ostentatiously, boldly, to poster-like effect, but in the crowd scenes he truly shows his virtuosity. 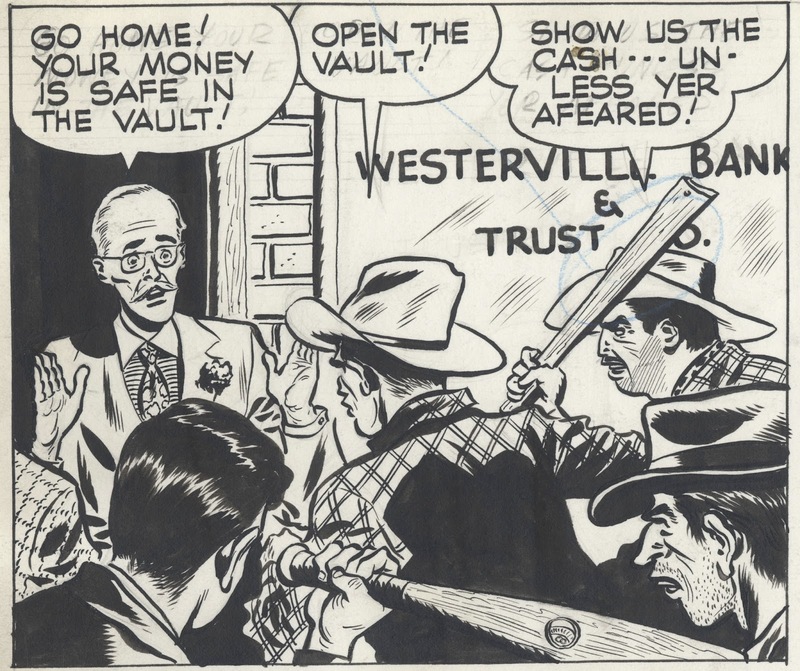 In this panel, the key element (the apprehensive banker) is framed by a rectangle, with the strong diagonals of the club and bat leading the viewer past the clot of F.G. heads to the banker in the B.G. Even the hats are pointing at him. Panel 2 ratchets up the tension, in a tornado-like swirl of small jagged black shapes as the mob sets upon the banker. There are 2 different kinds of ink slingers. One is the kind that benefits from having their work reduced in size for reproduction (as it hides the flaws), others, such as Elias, look better the more their work is enlarged. This panel is a prime example. 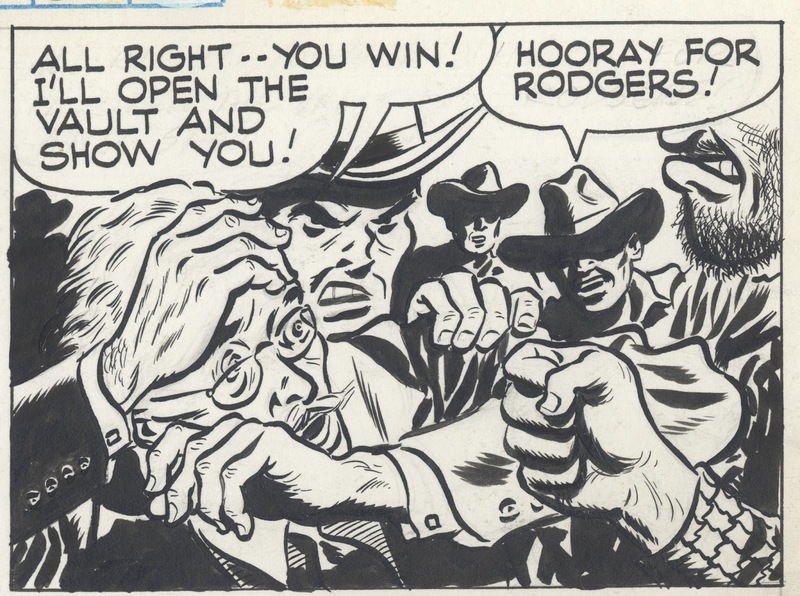 Panel 3 steps back, a moment of calm tension; the “camera” is on the harried banker and the mob reacting to something we couldn’t see yet if this were a movie. Again with the circular motif, almost, but not quite, the same size as the inset panels on previous pages. A moment of relative calm. 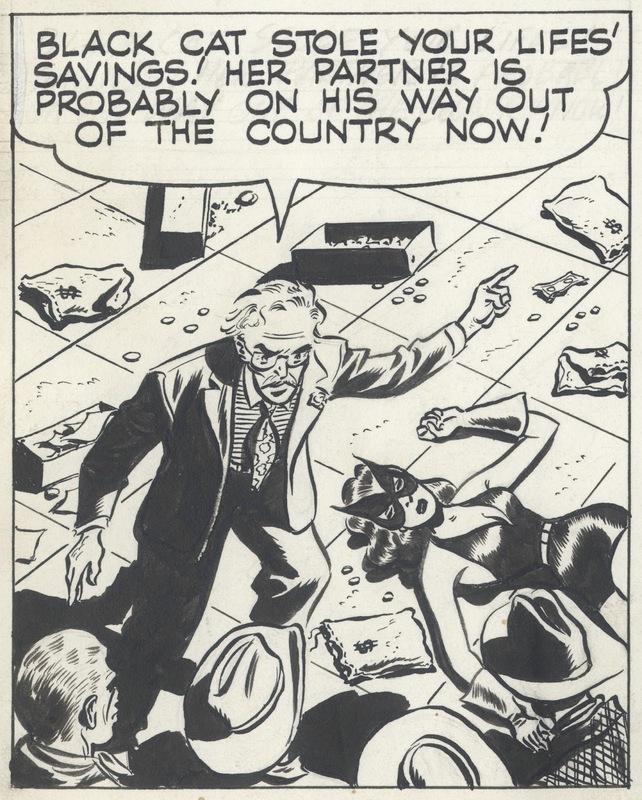 Panel 4: We see what the mob was reacting to in panel 3; a down shot Black Cat unconscious on the floor, tastefully posed upside down, beautifully drawn. The image speaks for itself, and I can only image it was the reason why many of the readers bought the comic. Panel 5: Another down shot, almost from the same angle, as though the camera craned upward slightly, allowing room for the banker and the mob to enter the shot. Panel 6: Another iconic shot in a story replete with them. Elias is obviously having fun with the town folks, undercutting a scene of horror with humor. (It’s nice to see the ladies (or lady) getting in on the lynch mob action.) Again, blacks are spotted with skill, clarifying, emphasizing, leading the eye through a complicated composition. 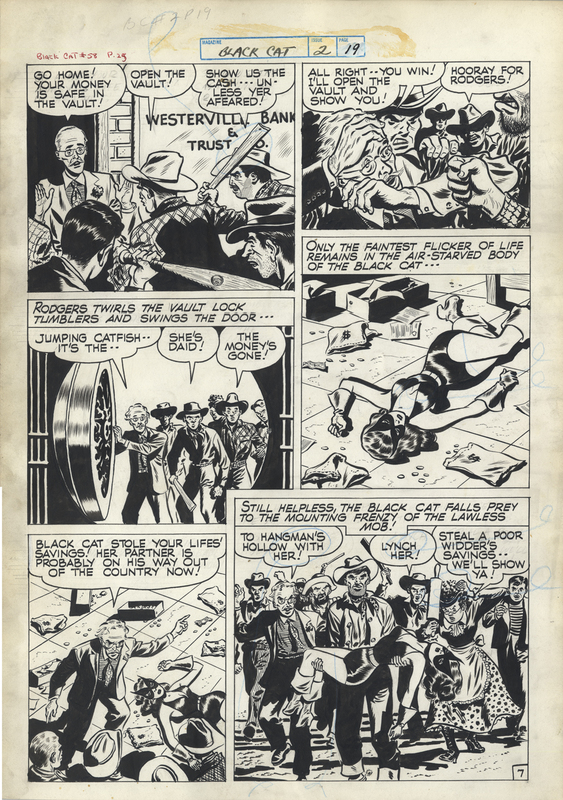 This is page #7 of 9 from “Banker’s Holiday”, starring Black Cat, from Black Cat #2, published by Harvey Comics in 1946.